With the school year now in full swing, it’s important to draw attention to family caregivers. 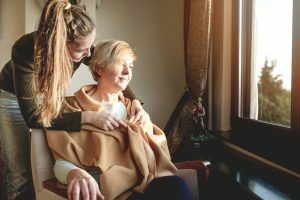 At some point in their lives, most Americans will become a caregiver, not just as a parent but as a caregiver to a husband or wife, an aging parent, relative or friend. In doing so, they help to manage that individual’s everyday activities, finances or medical care. In general, because of their nurturing tendencies, women are more likely to take on the role of caregiver. According to a report by AARP and National Alliance for Caregiving, 60 percent of caregivers are women. The report also notes that women caregivers tend to have more stress and other health problems than men. Caregiving produces rich rewards, but it can be challenging, and stress can creep in, both physically and emotionally. In fact, caregivers report much higher levels of stress than those who are not caregivers. Stress affects everybody differently. It can cause sleep deprivation, anxiety, depression and changes in activity levels or appetite. Over time, it can lead to other physical changes and a weakened immune system. Taking care of yourself before taking care of others has to be your priority, and one of the most important ways you can do this is by asking for help. For women, they often feel like they have to do it all. But when you’re in a caregiving situation, you have to ask for help, even if it goes beyond your comfort zone. Ask a friend to get your groceries or sit with your family while you take a break. Along with asking for help, you have to maintain relationships. Too often, people let activities and relationships slip. Make a point to reach out to others and participate in activities with friends or family. In addition, have hobbies that you enjoy independently. It doesn’t have to be a large activity. Go outside for fresh air, read a book or assemble a puzzle. Try to find something that doesn’t involve a computer, tablet or phone. Diet and exercise are another way to maintain energy and lower stress. Choose healthy foods and find time each week to be active. Be sure to get enough sleep every night. 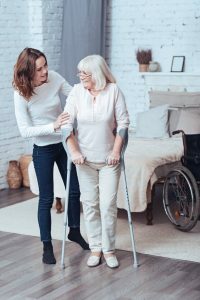 There are also many groups out there for caregivers that offer support, encouragement and a time to share with others who are going through the same thing. Finally, see your primary provider regularly and let them know you are a caregiver. Your role as a caregiver is extremely important, so it’s crucial that you accept encouragement and help from others while focusing on your own health.